My market stall neighbours sell healthy snacks. I always think it is funny standing there as they describe their flourless, sugarless treats and I look down at my bagels, filled with (glorious) gluten, white flour and sugar. I am, however, always surprised when we share a customer, but I guess in the end, you can’t argue with tastiness whether it’s a healthy snack or more of a treat. A whole section of their snacks is various flavours of roasted chickpeas. Until they came around, I totally forgot about these little guys, which are in many ways the perfect savoury snack. I used to love making them and sprinkling them over homemade hummus. They are simple, easy to make, customizable, pretty filling, healthy and crunchy. 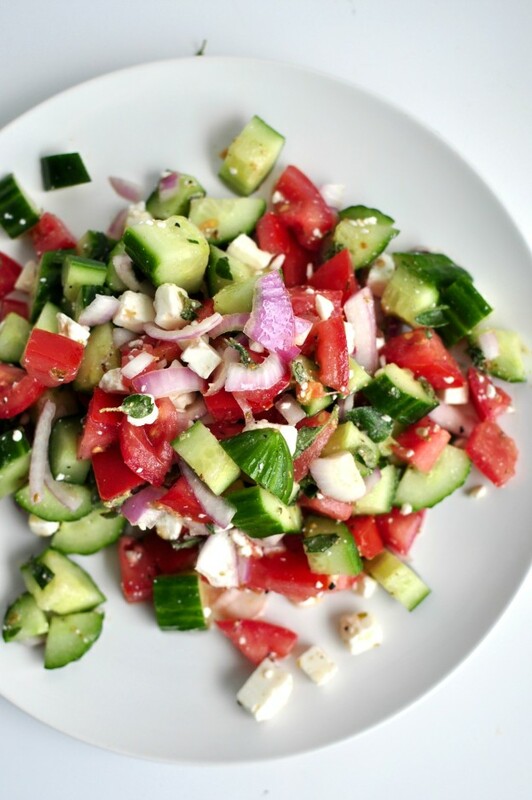 So, last week, I made a batch of slightly spicy, salty chickpeas and threw them in a salad, which turned a simple bowl of tomatoes, lettuce and cucumber into a light, summer meal. 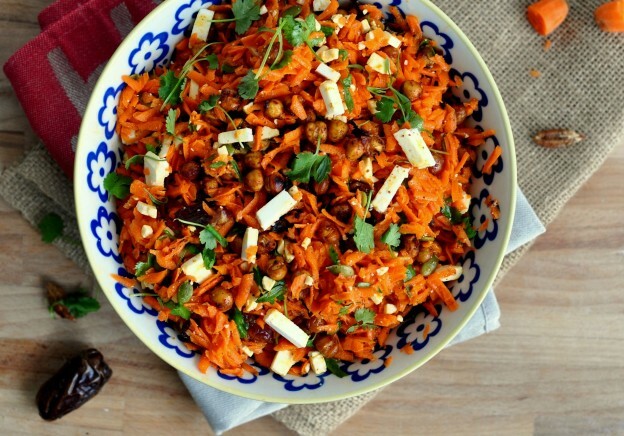 This entry was posted in Appetizer, Lunch for Work, Potluck Dishes, Salad, Side dish and tagged BBQ, carrot salad, carrot salad recipe, chickpea, dates, easy salad recipe, feta, food, fresh, Healthy, healthy recipe, moroccan salad, moroccan salad recipe, potluck, recipe, Salad, salad recipe, shredded carrot salad, shredded carrot salad recipe, Summer, vegetarian, vegetarian recipe on July 25, 2015 by mysecondbreakfast. You know when you make something so often that you think everyone knows how to make it too? That it’s part of everyone’s repertoire? This was definitely the case with this pasta. Of course it makes no sense to think this way, but somehow, when you make something so often it feels like it is too boring to share. It is funny because I have definitely posted just as simple (and even simpler) pasta recipes up here, but thought they were more interesting because they were new to me. The other day when we were eating this for dinner, my boyfriend asked if it was up here on the blog, and I scolded myself for waiting so long to share it. 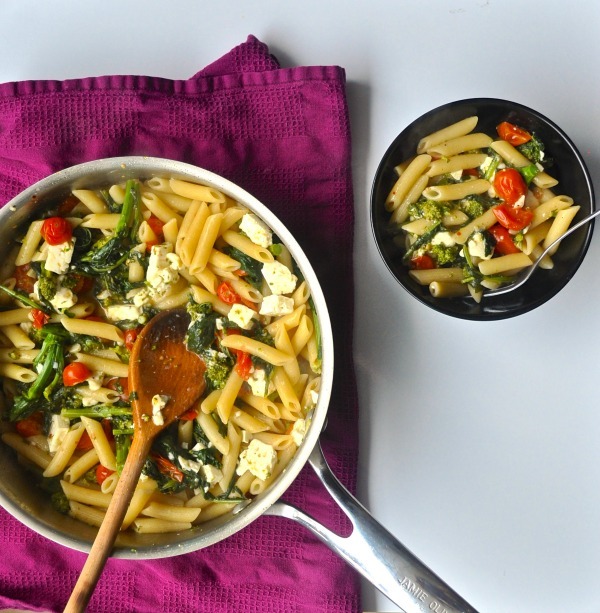 This entry was posted in Fast Weeknight Dinner, Lunch for Work, Main, Pasta and tagged Cheese, cherry tomatoes, dinner, Easy, feta, feta penne pasta, feta penne pasta recipe, food, Healthy, italian, pasta, rapini, recipe, vegetarian on February 22, 2014 by mysecondbreakfast. There’s something about cauliflower, artichokes and asparagus that are completely delicious to me. They make me salivate just thinking about them, and have since I was a kid. I realize now that this is kind of weird but I bet that my sisters would say the same. What does this random assortment of vegetables have in common? My mom always served them with a sauce that was basically just mayonnaise, sour cream and lemon juice mixed together. As kids, it was the best thing ever. We would practically fight over the stuff. We couldn’t get enough. 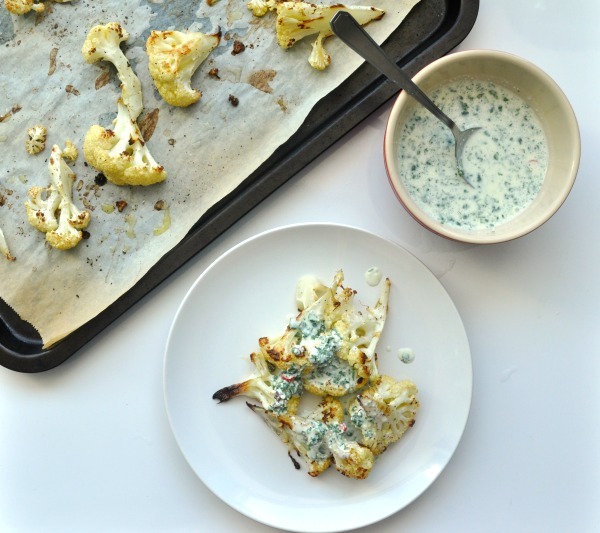 This entry was posted in Side dish and tagged Appetizer, cauliflower, coriander, feta, food, recipe, roasted, roasted cauliflower, roasted cauliflower recipe, sauce, side dish, vegetarian, yogurt, yogurt feta recipe, yogurt feta sauce recipe on February 17, 2014 by mysecondbreakfast.